Beautiful artwork and a very knowledgeable guide. But she really needed to update her equipment from the technician in the beginning of the tour, as everyone on the tour was having trouble hearing and understanding her. This was an easy to follow tour. 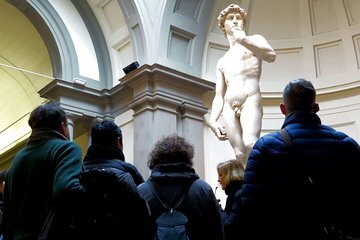 We enjoyed seeing the David, now my favorite sculpture of all time! Our tour guide was great at relating to the international group of tourists and she got us through the gallery at a nice pace. We saw some great sights and learned a lot along the way. David was definitely the must see in this gallery but it was great to see other paintings, sculptures and even instruments. Was worth skip the line here. I was booked early morning and queue for those not booked in skip the line was over 200 metres long so I gather it only to longer during the day. Great tour guide the tour was really worth it. The Gallery is great and so was the tour. That said, you need to reset your expectations about the 'skip the line'. And while yes you do get to skip the line, what you need to realize is that almost everyone has a similar tour. So, my advice is to pick one of the earliest timeslots so that when you meet your group guide and get into the tour line that its not around the block. The guide was boring, telling almost one hour only facts about David. You definitely want to skip the line! The Accademia gallery was mainly worth seeing for the Michelangelo sculptures. The whole top floor is Byzantine religious art which is a fantastic collection if that is your interest. The tour was the best way to skip the lines, but the tour itself was not overly informative or thorough. The tour of the museum was amazing. Our guide was knowledgeable about the artwork and artists. What was a challenge - and the reason I did not give the tour a full 5 stars, was that we got lost trying to find the meeting point. We had downloaded Google maps on our phones to use offline, only it does not work for walking instructions. It was snowing when we got to Florence and wandering through the city, trying to find our meeting point, was a challenge. Clearer instructions on how to find it would have been helpful.